Waterloo – “Green” buildings work to lower emissions and energy use, but consistently fall short of meeting their forecast targets due to the "performance gap," which occurs when the "people side" of sustainable buildings is not sufficiently addressed. Wilfrid Laurier University Psychology Associate Professor Manuel Riemer, York University faculty member Joel Marcus and their research partners have received nearly $1 million in funding for their research into closing this gap through a Ministry of Research, Innovation and Science Ontario Research Fund - Research Excellence (ORF-RE) grant. This five-year project entitled, “Closing the performance gap in high-performance green buildings by cultivating a culture of sustainability,” will be based in evolv1, a LEED Platinum and net positive energy multi-tenant office building. The building, designed and owned by the Cora Group and envisioned in partnership with Sustainable Waterloo Region, is located within David Johnston Research and Technology Park. Riemer and his partners will create an evidence-based engagement strategy to develop a culture of sustainability in green office buildings that can be successfully transferred to other commercial building projects. He says innovative approaches like this must be part of the strategy to reach the ambitious carbon reduction goals set by the Ontario and Canadian governments. The Ontario Research Fund - Research Excellence (ORF-RE) provides research institutions with funding to help support the operational costs of large-scale transformative research of strategic value to the province. Ontario invested close to $94 million in 86 research projects, including the $999,677 in funding for this project. 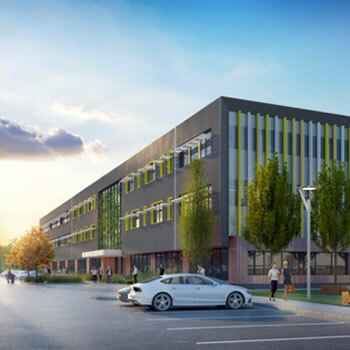 Riemer was also recently funded through an Occupational Health and Safety Futures Research Grant from the Government of Alberta for the project "Realizing the full potential of green-certified government office buildings in promoting employee mental health." The project will collect data from 30 government buildings within Alberta to understand how green-certified buildings contribute to employee well-being and productivity. Riemer is an expert in the psychology of sustainability. Using community and other psychology principles, theories and tools, Riemer’s research addresses issues related to sustainability, including global climate change mitigation and resiliency, with a special focus on engagement in environmental action. Riemer is the director of the Viessmann Centre for Engagement and Research in Sustainability (VERiS) at Laurier and a founding partner of the social enterprise Sustainable Societies Consulting Group.